I admit it, I can’t resist a new kitchen gadget. 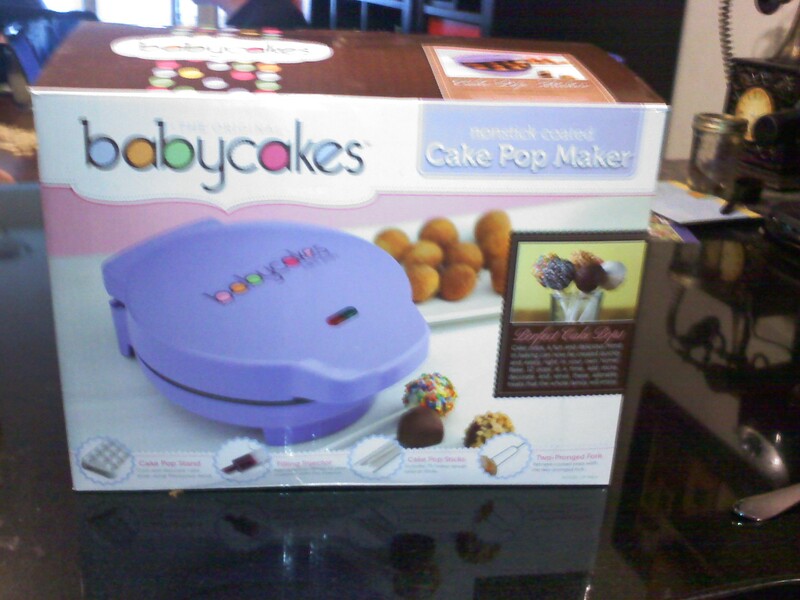 Last week I had the happy fortune of discovering The Babycakes brand Cake Pop Maker. I was in Kohl’s (one my favorite places) and in the Housewares section they had unveiled a display of all new fun cooking machines. I was carrying with me a coveted 30% off coupon so was quite excited. In addition to this machine they had also displayed other Babycakes items: a mini Donut maker, a Whoopie Pie Maker, and a Cupcake maker. On the other side of the display they also had a retro Cotton Candy maker and a Snow Cone machine, from a different manufacturer. I picked up the Cake Pop Maker and knew this was the one for me. Think of it like a Foreman Grill but with half circle indentations on the top and bottom that cook doughnut holes, or what they like to call Cake Pops, in 4-6 minutes. As if that wasn’t draw enough, it also comes with a special fork to remove the treats, a bag of lollipop sticks and a holder to cool the pops. An injector for jelly or filling was also in the book as well as a book of recipes. I held the Maker for awhile then realized if I just waited one more day I could also use my Kohl’s Cash ($10) so I could get this regularly marked item of $29.99 for about $4.00 (after 30% and my $10 coupon). I put it back. Sadly, the next day I went back to Kohl’s and they had none left. Nor did the other four locations I tried. I looked online and Kohl’s only offers the other machines. Undaunted, I went back two days later and figured I’d settle for the mini Donut machine. But as luck would have it, that particular Kohl’s had a floor model which they agreed to sell me after I begged. 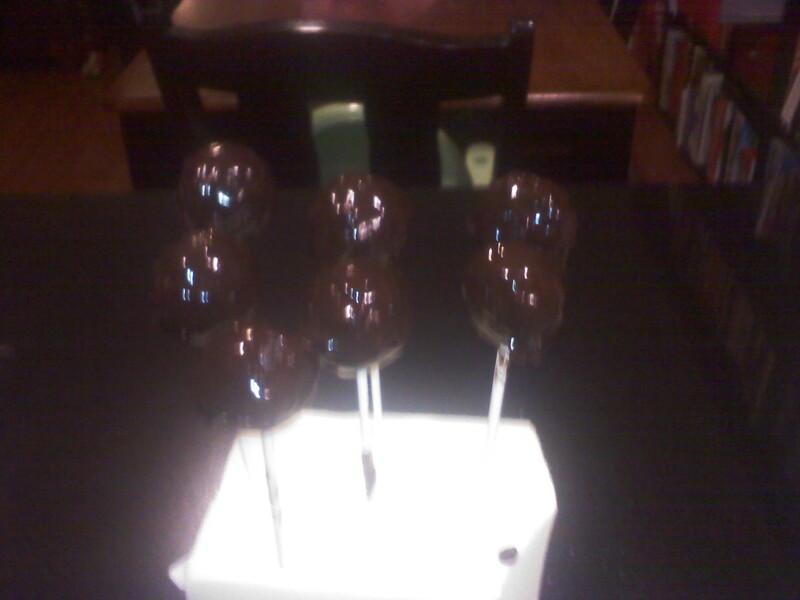 Friday night, I decided to make the chocolate Cake Pops. I followed the recipe which had all the standard ingredients people would have in a home: oil, eggs, sugar, flour, baking soda and powder, plus buttermilk. The recipe indicated that if I didn’t have buttermilk I could have just used real milk and vinegar but I opted for the real buttermilk, albeit fat free. I had hoped there would be an option to use a box cake mix but there wasn’t. I mixed up the ingredients, sprayed the inside of the machine with cooking spray and plugged it in. In a few minutes the green light came on. I poured in a little less than a tablespoon of batter into each hole then closed the lid. Sure enough, 6 minutes later, the pops were done (they look like Munchkins) and were easy to retrieve from the Maker. I cooled them in the holder that resembled a plastic egg carton. About a half hour later I put a half bag of chocolate chips in the microwave for 30 seconds with a little butter. I then added some milk since it was too thick. 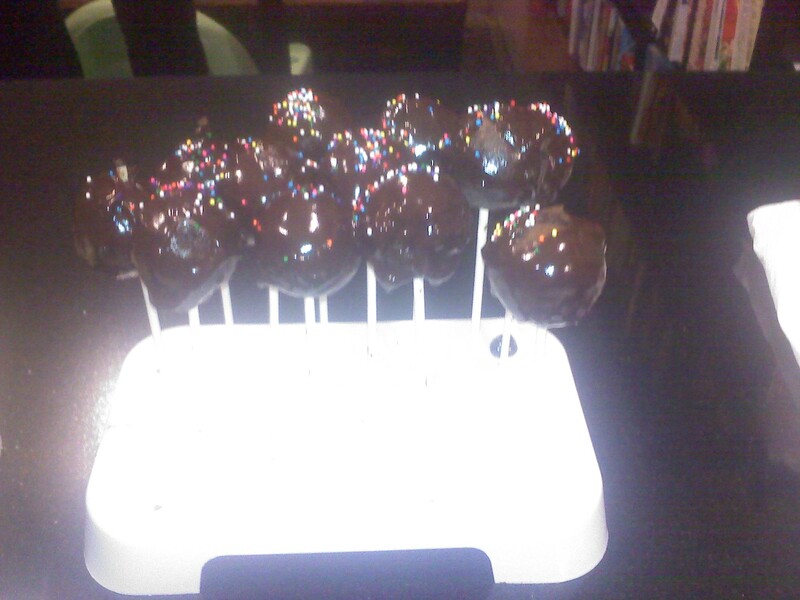 I stuck a lollipop stick in one and then dipped it into the chocolate mix until it was coated. I then dried it on the same plastic egg container tray, which has holes for just that purpose. I immediately sprinkled them with jimmies. Once they cooled in the fridge, I tried one (okay I ate one hot and melty too) and they were delicious, and FUN. I saved some that I didn’t coat in chocolate and tried the injector which was like a big gauge syringe. I filled it with caramel and …FAIL. It oozed all over the cake pop. I next dug a whole with a skewer but it was still a sticky mess. So while the injector really didn’t work, the machine is an awful lot of fun and if you can get your hands on one of these machines I highly recommend it. I discovered since I bought the machine that Starbucks now offers these treats individually for sale. All the more reason to get one of these machines, I say. I picked up some candy melts to coat the next batch and plan to make the Vanilla next time. Tracy L. Carbone is a New England fiction writer. Please visit her WEBSITE to learn move about her cooking tips and writing life.